Given the previous several days of clear weather and a forecast freezing level of 8000-9000 ft, I figured the south side of Saint Helens offered a great chance to find mid-winter corn snow on Thursday. I was hoping to ski up the standard winter route and then ski down through the Lahar (towards the southeast), rejoining Road 83 a few miles east of Marble Mtn Sno-Park, but this was not to be. David Coleman and I skinned nearly the whole way to the crater rim, but near 7600 ft the snow conditions became too firm to proceed, even using ski crampons on the 30 degree slope, so we hiked up the rest of the way. Throughout the day, skies had been completely clear with an occasional gusty east wind, but as we neared the rim the wind was roaring at 30-40 mph from the SW. We turned back about 20 ft from the edge of the precipice, too far to get any view into the crater, but this seemed safest given the high winds and massive cornices visible to either side (we were probably well out on the cornice at our high point). We abandoned plans to ski the Lahar and skied down our ascent route. The snow was firm, consistently hard windpack on the upper slopes, turning to fairly tricky and inconsistent trap crust below 7500 ft. Occasional stretches of nice softened snow, with several inches of corn on a firm base, could be found only on SW facing aspects, perhaps a total of 1000 vft of corn on the 5500 vft run. The last few miles of ski trail through the woods were mostly firm and frozen, but the softer stretches were fast and fun. Temps had remaining above freezing even at the crater rim and had probably reached 50+ F at the Sno-Park. Less than a dozen other skiers/boarders/snowshoers were seen on the route during the day. Most pleasantly, we did not see or hear a single snowmobile from the time we left the Sno-Park until we returned to the car. Of particular note were two massive avalanche debris piles visible in shallow gullies just east and west of the standard route. 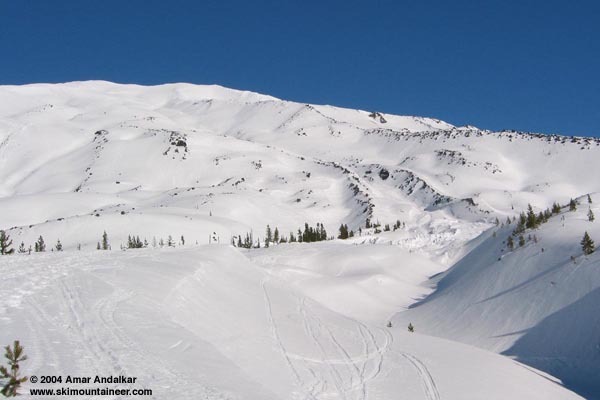 Both slides were major Class 4 avalanches, with deep debris toes reaching 4000 ft from crowns located near 6000 ft, and path lengths over 1 mile. Debris piles were estimated to be 50-100 ft deep, with numerous towering blocks of hardened snow extending 20-30 ft above the surface of the piles. The debris was spottily covered by 2-3 ft of recent snow, and the avalanches probably came down during the major rain-on-snow event of Jan 28-29, when 5-6 inches of rain fell on St Helens at elevations up to 7000 ft. This photo shows the slide in the gully east of the climbing route, looking up from just below 4000 ft. The other avalanche to the west of the route was much steeper and more spectacular, having run from a massive crown on the east side of Monitor Ridge, but it was too far away to get a good photo of the slide path or debris pile. I demand a shot of Dave Coleman ripping the corn. Give it up, Amar, I know you got it. Action, action! actually, the shot you want is the one I took of Amar huckin' the cornice into the crater....he's saving that one for the book!